Zak Irvin and Moe Wagner are winning on the court, even if the box score doesn’t say so. The junior wing Irvin and freshman forward Wagner have a combined two points, five rebounds, three assists and one steal in two games, making them the least-productive offensive players to see game action. But the No. 24 Michigan basketball team operates under a different scoreboard, and that one has Irvin and Wagner as two of the team’s top contributors. In what players and coaches have been calling a “Year of Accountability,” the Wolverines have been tracking contributions in both practices and games. To do so, coaches and managers have a 14-column whiteboard where they keep score. The categories aren’t just points, rebounds and assists, though. Instead, Michigan coach John Beilein is looking for effort plays such as “run the floor,” “talk,” “first to the floor” and boxing out. “We feel a need to solidify 12 guys down to a smaller rotation as soon as we can,” Beilein said. “There’s dead heats at several positions, whether they’re starting or just off the bench. This is all part of the process we’re going through to select who is playing as the season progresses. 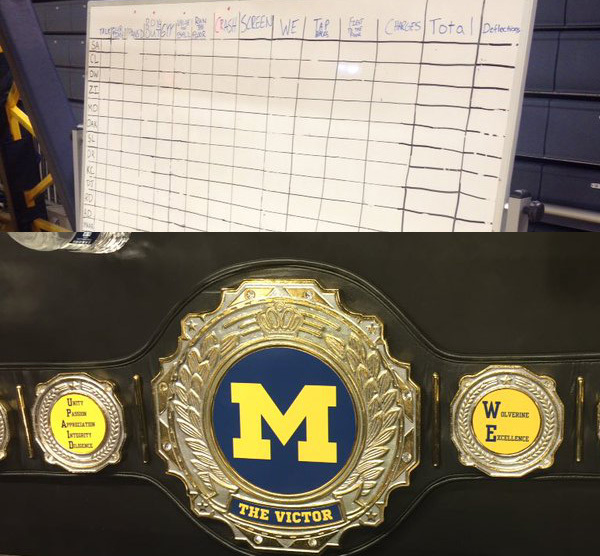 The direct goal of the whiteboard is to win the Victor Belt — a boxing-style fighter belt handed out after each week of practice — but the ultimate goal is to help the team win. Though Wagner is the youngest and rawest player on the team, Beilein is adamant he does that day in and day out. 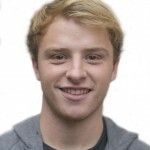 “I realize he’s still a freshman, (but) he’s making energetic mistakes,” Beilein said. “He’s not standing around, he’s just really a pleasure to coach. The other day we were putting in the zone offense and he wanted to show me a play that he liked and ran before that really works against the zone. Besides drawing plays, Beilein said that Wagner scores high in effort plays, and scores even higher once he sees the results. After getting bullied on the boards in early practices, Wagner applied himself to become a better rebounder. Now, after getting pushed around and struggling to keep up in games for extended periods of time, Beilein expects Wagner to grow even more. 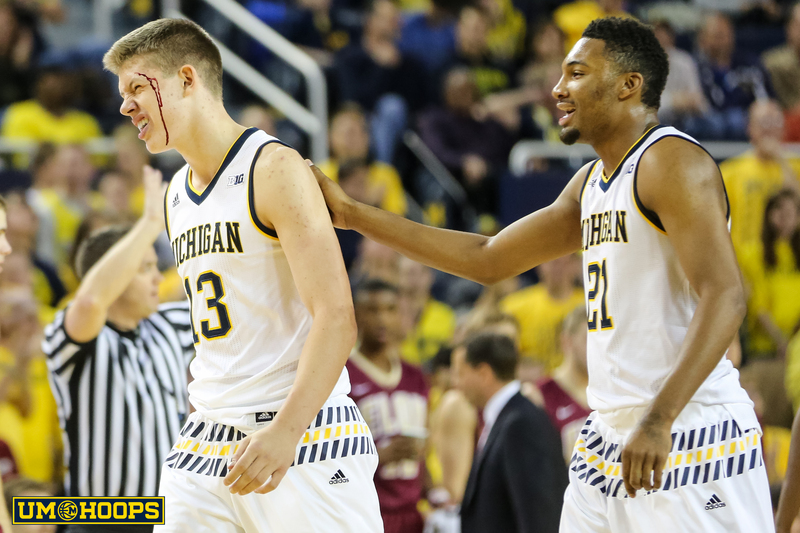 “The more he gets knocked down because of his lack of strength, I sense he’ll spend more time in the weight room,” Beilein said. Irvin, on the other hand has plenty of experience and developed skills, but is still working his body back to its explosive self and for his shooting to return to form. Irvin was 0-for-5 in his debut Monday. Beilein noted that those areas were always above-average, however, and that his development in other areas trumps the lack of points. According to junior guard Derrick Walton Jr., Irvin’s growth away from points came when Walton and senior guard Caris LeVert ended their seasons early with injury. Without those two, the offense had to run through Irvin, and Irvin realized how important the categories on the accountability chart were. The win-first attitude has always existed for the Wolverines (and just about any team), but Walton says the whiteboard and championship belt are new this year and unique to Michigan. Similar to the football team and coach Jim Harbaugh’s desire to make everything a competition, the board is set to ensure every part of practice counts. Irvin and Wagner have yet to bring impressive numbers to the game. But as long as they contend for the belt and light up the whiteboard in practice, Michigan will be just fine.